As part of the Brighton Fringe Festival, the Old Police Cells Museum in Brighton Town Hall is presenting a unique exhibition, The Story of Women in Modern Policing, Sussex 1915-2015. Working in concert with the museum, the exhibition has been set up by Evolve, the Sussex Police women’s network group. The exhibition is open daily from Tuesday to Friday (May 19-22) between 10.30am and 1.30pm. The exhibition marks and celebrates the achievements of women in Sussex who have served their community in many different roles within the force. 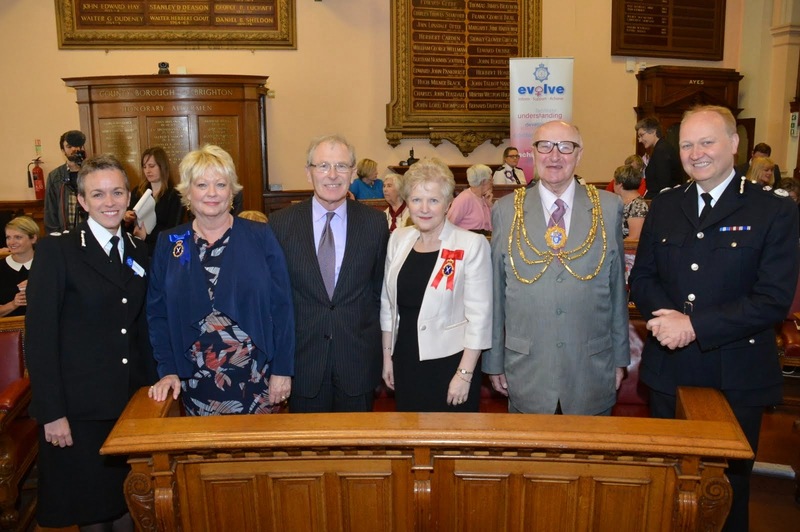 The launch was celebrated today by a reception at Brighton Town Hall and a presentation which charted the history of women in policing in Sussex. Left to right: Deputy Chief Constable Olivia Pinkney; High Sheriff of West Sussex, Denise Patterson; Lord Lieutenant of East Sussex, Peter Field; High Sheriff of East Sussex, Juliet Smith; Mayor of Brighton and Hove, Councillor Brian Fitch; Chief Constable Giles York. Exhibition launch in Brighton Town Hall. Click on photo to open a large version in a new window.